students about careers in marketing. Five Pittsburgh marketing management professionals working in a variety of industries — from banking and fashion to higher education and retail — led a panel discussion about careers and networking at Instructor Chris Lovett's Advanced Marketing Management class Oct. 20. Students from SAEM Assistant Professor Paige Beal's class also joined the discussion that evening. 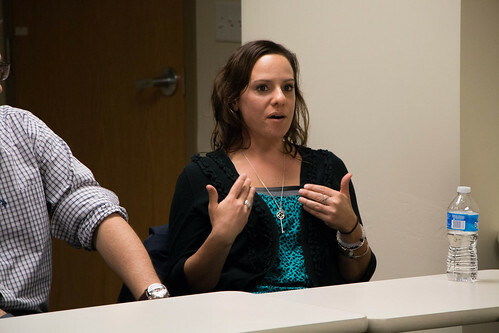 "The panelists are from my career social network and are people I admire based on my experiences working with them," explained Lovett, who earned an M.B.A. degree from Point Park in 2007. "I also selected this group based on their diverse set of professional backgrounds. I felt they could give students solid advice and insight on a variety of marketing careers," he added. The importance of keeping connections throughout an entire career was a point that resonated with accounting senior Matthew El-Tahch. "I learned you should never burn bridges and to always make yourself available to others," said El-Tahch. "I gained many helpful tips from the career panelists that I will use as I start sending my resume out," remarked Audrey Gulan, a senior business management major. "It was interesting to hear what each of them look for when going through all of the resumes they receive." To succeed in the marketing profession, the panelists encouraged the students to be prepared to navigate their own careers and stay up-to-date on the latest digital and social media trends. They also stressed the importance of networking and taking chances at a young age. "The panelists were very open and honest and I think their advice was well received," said Lovett. In his fourth year of teaching at Point Park, Lovett has hosted in his classes several career panels, a Google Hangout with an executive from Twitter and a Super Bowl marketing chat garnering more than one million impressions. "What I enjoy most about teaching at Point Park is the freedom I have to bring experiential learning and innovation into the classroom. I think this is crucial to the students achieving career success," said Lovett. "The content in Chris's class is realistic and easily relatable to real life," Gulan said. El-Tahch added: "This is my second time taking one of his classes. I like his teaching style and how he engages the class with real-world examples. He is dedicated to helping students find success in their careers."